This review of Scholl Advance Athlete’s Foot Cream was written in order to provide a comprehensive view of the product and help prospective customers understand the benefits and disadvantages of purchasing this treatment for athlete’s foot. 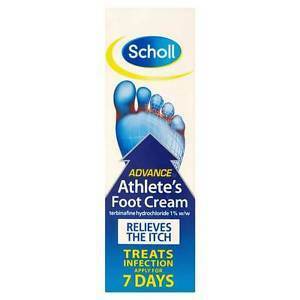 Scholl Advance Athlete’s Foot Cream is designed to treat athlete’s foot by using Terbinafine as the main ingredient which is an anti-fungal ingredient and used to treat skin infections caused by fungi. It provides long lasting protection. The product is not available on its website but available on other shopping websites. Read on to learn more about Scholl Advance Athlete’s Foot Cream. The cream has to be used for seven days. It is to be applied once or twice daily to the affected skin and surrounding area in a thin layer and rubbed in gently. Before application, the affected skin areas should be cleansed and dried thoroughly. In the case of intertriginous infections the area may be covered with a gauze strip, especially at night. The relief from symptoms usually occurs within a few days. Irregular use or premature discontinuation of this treatment carries the risk of recurrence. If there are no signs of improvement after two weeks, the diagnosis should be verified by a physician. The cost of a 15 g cream on a leading shopping website is £5.99, not including shipping charges. Since it is not being sold on the product’s website there are no discounts or offers available for this product. There is no guarantee being provided by the manufacturer and therefore leaves it up to the discretion of the customer to go ahead and try the product. Since it is an established name in the field of foot care, it relies on its popularity to work for it. The customer reviews are to be found on shopping websites and they are very encouraging and positive. All the customers come across as happy with the results after using this cream. Scholl Advance Athlete’s Foot Cream comes across as a reliable foot cream to treat the athlete’s foot and has a lot of positive reviews to back its claim. The ingredients have been listed in detail which is helpful for a customer to assess whether or not the ingredients are suitable. The directions on how to use the product have been given in detail. However, the product does not provide any manufacturer’s guarantee. It also comes with a set of warnings that should be followed. One should avoid contact with the eyes as it can cause irritation and burning. Once the tube has been opened for 2 weeks, do not use the cream. You are supposed to return it to a local pharmacist who will dispose of it properly. The cream is not meant for children and should be kept out of the reach of children. Jimmy Rodriguez	reviewed Scholl Advance Athlete's Foot Cream	on November 19th	 and gave it a rating of 2.5.